MILAN (AP) AC Milan coach Gennaro Gattuso is never going to draw comparisons with Brad Pitt – and he doesn’t want his team to either. The bearded Gattuso is getting compliments as a coach as his rejuvenated Milan has climbed up to seventh on the table, sparking talk it could still sneak into the Champions League. ”We’re not even in the Europa League because Sampdoria is ahead of us in the standings,” Gattuso says. ”We’re taking it day by day and let’s not forget how we were two months ago. Victory at home over Sampdoria this Sunday would draw Milan level on points with the sixth-placed side, which is currently six points behind fourth-placed Roma and the final Champions League spot. Milan has momentum. It has transformed under Gattuso. There were grumblings in November when he took over from Vincenzo Montella. The club’s other recent moves to hire former playing stars as the coach hadn’t worked out: Clarence Seedorf and Filippo Inzaghi had ignominious spells on the Milan bench. Gattuso, a gritty midfielder who helped Milan to two Serie A titles and two Champions League trophies, got off to a terrible start. His first match in charge saw Milan draw at Benevento, which hadn’t picked up a single Serie A point all season, after a stoppage-time equalizer from the home goalkeeper. Gattuso’s second match was as bad, with Milan losing to Croatian side HNK Rijeka 2-0 in the Europa League. A mixed run of results followed before the turning point, an extra-time victory over Inter Milan in the Italian Cup quarterfinals. Since then, Milan has been undefeated and won four of its past five league matches, including 2-1 over Lazio. Winning has increased the focus on Gattuso, and revealed an eccentric nature. After the Lazio win, he allowed his players to slap him in an exuberant huddle. For now, it works. He has succeeded in doing what he said was one of his first priorities when he was promoted from youth team coach, creating a strong sense of team spirit. That is one of the reasons he doesn’t change his starting lineup much, and doesn’t plan to despite a packed fixture list including Roma and Inter in Serie A, Lazio in the second leg of the Italian Cup semifinals, and Ludogorets in the Europa League round of 32. ”I want to give continuity to the positive things that we are seeing in the team, but everyone’s chance will arrive,” Gattuso says. ”I’m changing the team little because I don’t see too much tiredeness, the players are managing to recover without any problems. Based on its previous six league matches, Milan would be third in Serie A, behind only Napoli and Juventus. 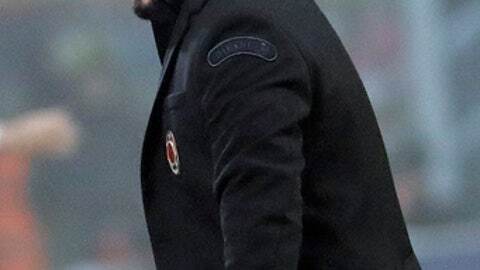 Gattuso, however, is bottom of the table in one matter: Salary. The Milan coach is still on the same wage he earned when in charge of the youth team, which according to Gazzetta dello Sport is 120,000 euros ($150,000) a year, making him the lowest-paid coach in the Italian top-flight. Fabio Pecchia at Hellas Verona is the next lowest, on 250,000 euros ($312,000) per season, while Massimiliano Allegri at Juventus is on a reported 7 million euros ($9 million). Milan is set to open contract talks with Gattuso soon on a new, longer-term deal.